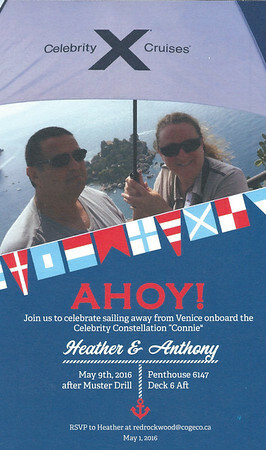 From the Hotel Tritone, we hired a private van and co-shared the travel with two fellow cruisers who we had “met” on the Cruise Critic roll call. We were happy to have the semi-private transport from the hotel that took us directly to the Cruise Ship Passenger terminal. No fuss, No muss! We proceeded to the gang way, went through security (again) and boarded the ship. All suite guests were recognized from their silver folders and escorted to Michael’s Lounge. We met Megan, our Michael’s Concierge and then sat for a little while to relax. I had mentioned to Megan that we were vegetarians and would like to view the menus for Ocean Liners, Tuscan Grille, and all the Luminae menus for the week. All menus were provided, as requested and it assisted us to decide when/where to eat to suit our dietary restrictions. Megan had mentioned that all suite guest were being invited to a private sail-away on the helipad, but we had already planned something with a few people from the Cruise Critic roll call. I am sure the views from the helipad would have been lovely, but see notes below about views from the aft. 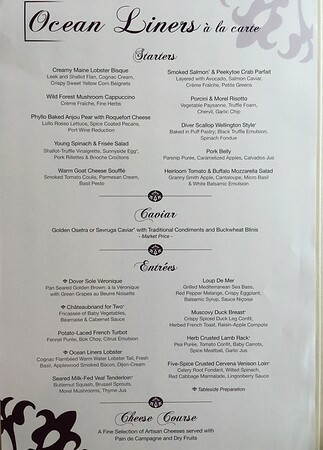 We then decided to go for lunch at Luminae (Suite Class restaurant) and after lunch returned to Michael’s. “Rodney”, the butler for PH 6148 escorted both penthouse guests (6148 and 6147) to their rooms. We would meet “Homer”, our butler later that day. When we walked into 6147, we were amazed. On line videos and photos simply do not do the suite justice. It is large, classy, and a dream. I felt very thankful and appreciative to live in “modern luxury” for the next 10 nights. After a short while, we met Homer, our butler for 6147. 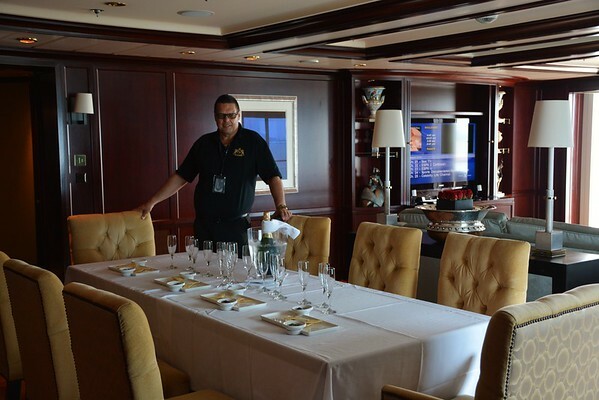 I had requested if he could provide a few extra champagne glasses for after the muster drill, as we were expecting a few guests over to sail away from Venice. 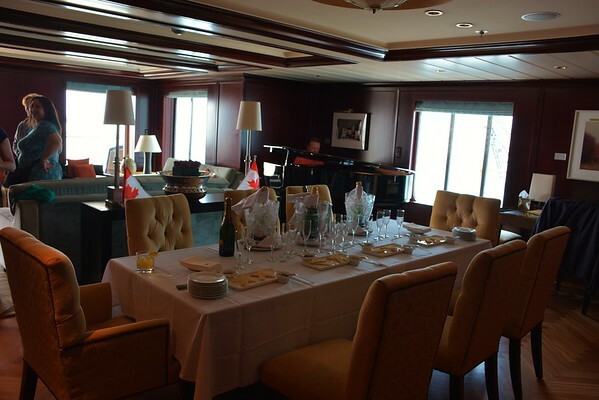 We were pleasantly surprised after the muster drill that not only did he supply extra glasses, but he dressed up the dining room table with linens, the champagne was in a cooler full of ice, and he had set up small trays of nibblies for everyone to enjoy. How very thoughtful of him! 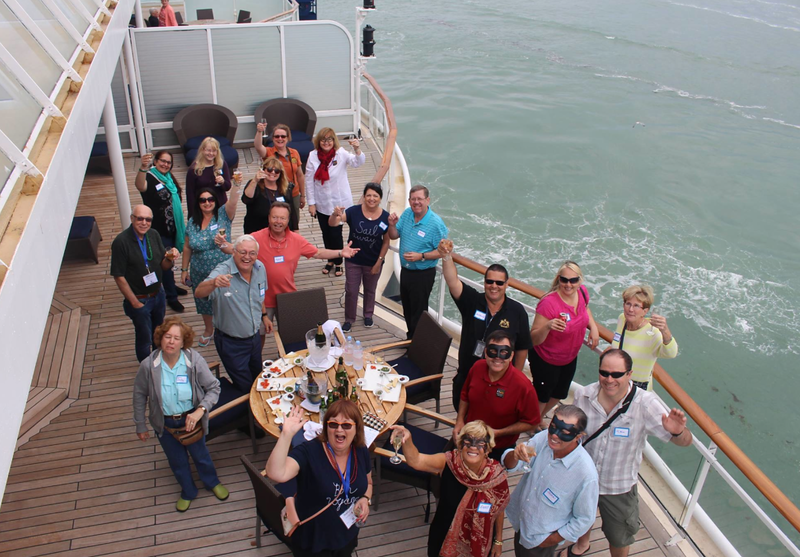 Our guests arrived in time for the absolutely amazing sail away from Venice. Whether from the Penthouse Deck, *any* of the Aft-facing cabins, and/or the Ocean View/Sunset Bar terraces, I highly recommend viewing the sail-away from the Aft-facing decks/cabin, areas. It truly was breath-taking! 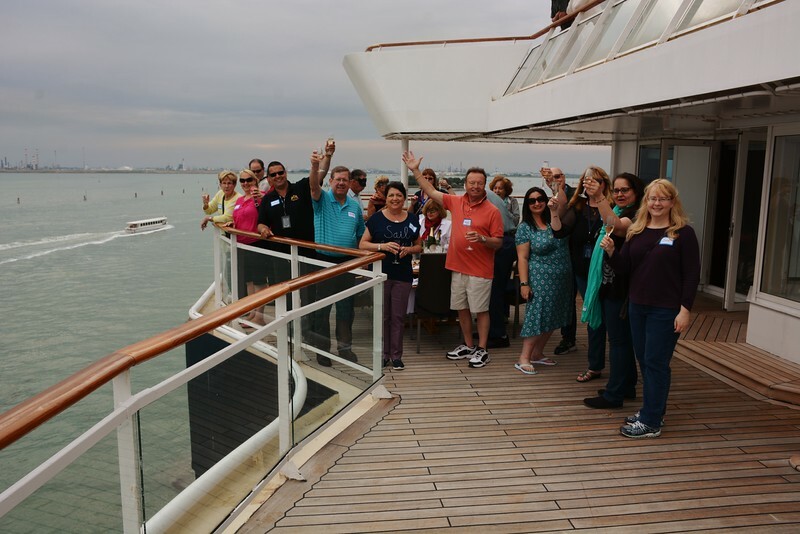 Our group had a fantastic time sailing away from our deck and we were so happy to share the spectacular views with them. One of our guests had asked to start a tip jar for Homer and it was well received. We were able to provide Homer with an extra gratuity for being thoughtful and enhancing our sail-away experience. 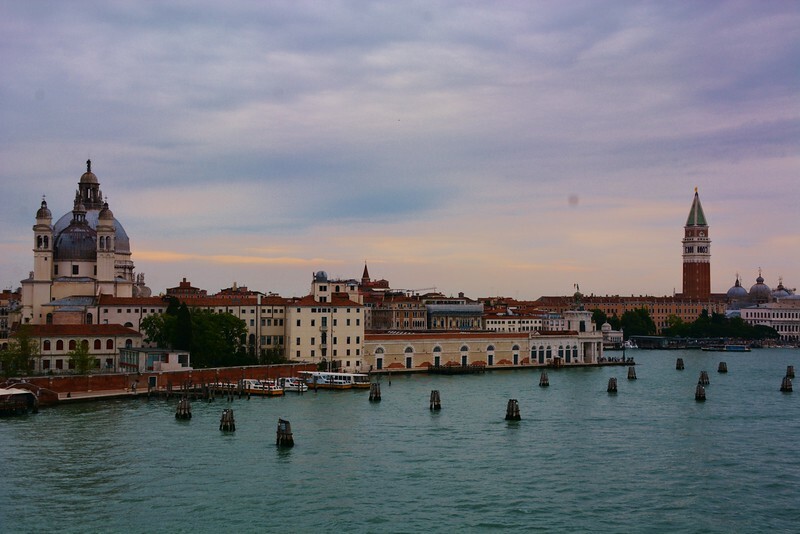 Sailing away from Venice with such spectacular views will be fondly remembered for years to come. As a Royal our Penthouse Suite guest, one is entitled to unlimited Specialty Dining. Therefore, this trip, we really wanted to sample as much as we can from as many restaurants as we could. Night number one, sailing out of Venice, we decided to reserve Ocean Liners for 7:00 pm, after our sail-away. We informed the Maitre’D of our vegetarian lifestyle and he was very accommodating, making suggestions, such as having the Risotto as an Entree in lieu of a Starter as printed in the menu. We began our dining with the “Wild Forest Mushroom Risotto” (with Creme Fraiche and Fine Herbs). It was light, refreshing, and actually looked like a cappuccino! Following the cappuccino, we indulged in a warm goat cheese souffle (with smoked tomato coulis, Parmesan cream, and basil pesto). This dish was very good, but rich! For the main course, we both had the Porcini & Morel Risotto (with vegetable paysanne, truffle foam, chervil, and garlic chip). This was a lovely dish that we both enjoyed very much. For dessert we had a lovely brulee, but honestly cannot remember the name of it – just simply put it was very lovely! 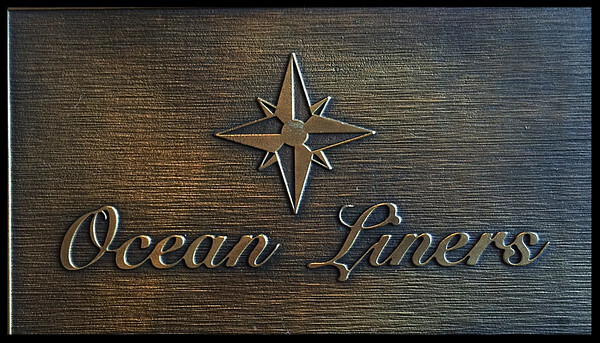 Uploaded as well are photos of the set menu for Ocean Liners. You can see it does not quite suit vegetarians that well and definitely not vegans (with the creams and butters); but the staff is willing to accommodate you the best that they can.